Tue. - Thur. 5 p.m. - 9 p.m.
Fri. 5 p.m. - 12 a.m. 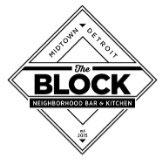 The Block (Formerly The Grille Midtown) is committed to delivering thoughtfully cooked food and cocktails with uncommon hospitality in our renewed and exciting restaurant space. We take extra care to ensure or guests feel good while delivering an incredible dining experience. Detroit's newest eatery and bar is sure to be the place for good food, good drinks, and great friends.